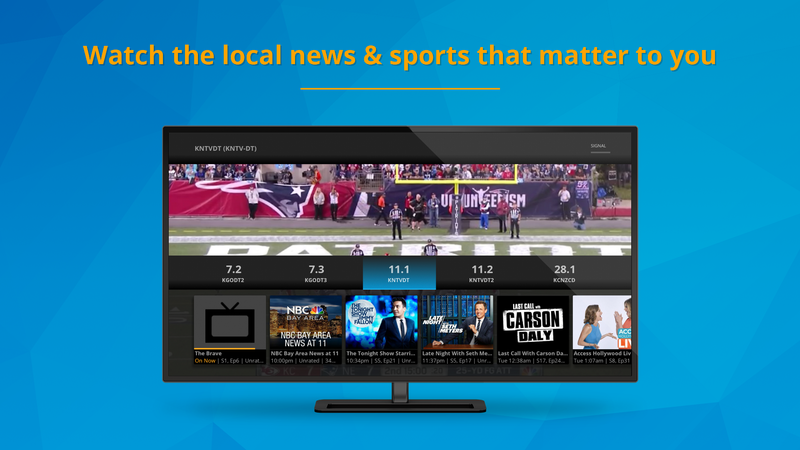 AirTV, like its sister company Sling TV, is a wholly owned subsidiary of Dish Network. A few weeks shy of one year ago, at CES 2017, they revealed the AirTV Player which is a set-top box running Android TV. Combined with an optional AirTV Adapter, which is a USB over-the-air tuner that plugs into the back of the AirTV Player, the two devices promised to merge free local OTA channels with the Sling TV subscription service and 3rd-party streaming apps, like Netflix, into a single product. The devices received lackluster reviews, so now it looks like AirTV will be reverting back to what it seemed like they originally planned to release prior to the set-top box. 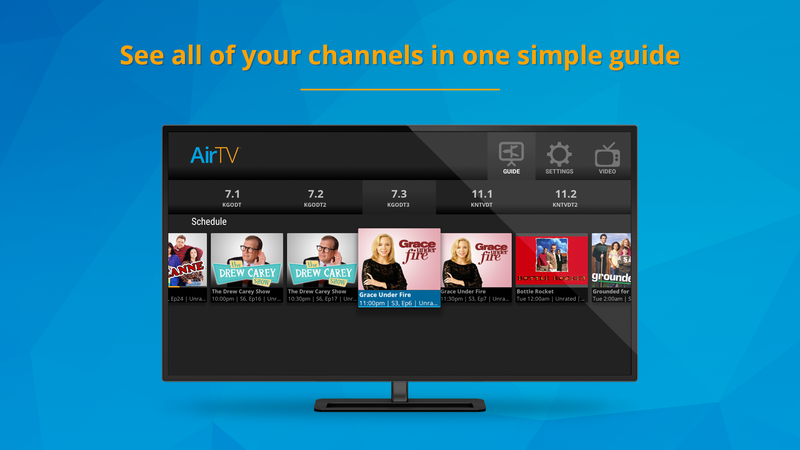 AirTV looks to be ready to release a new network tuner box that will stream OTA channels to a stand-alone AirTV app, as well as to the Sling TV app so that customers can have local broadcast channels mixed in with subscription channels. A new app, named “AirTV: Watch Local TV Anywhere,” briefly appeared in the Amazon Appstore, for Fire TV devices and Fire tablets, earlier this week before it was promptly removed. The same app appeared briefly in the Apple App Store, for the Apple TV and iOS devices, and is currently still listed in the Google Play Store as an unreleased app. The app description explains that “AirTV connects an OTA antenna with your WiFi network,” just like a Tablo TV, and allows you to watch local OTA channels on “every internet-connected TV and device in and outside your home.” Unlike a Tablo TV, however, there is no mention of any kind of DVR capability, so it doesn’t seem like it can time-shift a live broadcast. When first seeing this new AirTV app appear, I thought that AirTV was simply releasing an app that allowed owners of the existing AirTV Player to view its OTA content on other devices, but that doesn’t seem to be the case. The app description mentions that “you’ll need a mobile device (phone or tablet) for setup,” which implies that it’s a new device that does not connect directly to a television. Additionally, help instructions in the AirTV app for Android devices instructs users to “Please perform a hard reset (hold the reset button on the back of your AirTV until the network LED on the front panel blinks once and then blinks twice quickly) before you can configure your AirTV box again.” The existing AirTV Player has no such reset button, so it definitely seems like a new AirTV branded network tuner will soon be announced. Likely at CES next month. It sounds like the new AirTV box will fulfill what the existing AirTV Player originally promised, which was mixing local channels alongside subscription channels in the Sling TV app. If that is the case, Sling TV might offer a new less expensive plan for AirTV owners that removes streamed local channels and replaces them with their free OTA equivalents. CES 2018 kicks off on January 7th, which is when I’d expect the new AirTV hardware to be unveiled. I’ll be there to cover it, so stay tuned. Hopefully there will be a DVR. I have read they are working on it. I’ve had my WatchAir for a few weeks and love it! Sling TV integration could make me look at the AirTV though. Plex OTA works for me , plus they have a DVR feature. Be careful purchasing anything related to OTA TV right now, the FCC is going to be rolling out ATSC 3.0 or Next Gen TV sometime next year. While the current standard has at least 5 years of life left(maybe at reduced quality), you could very well have the new standard very soon in your area. All current tuners will not be compatible with ATSC 3.0.